Our unparalleled patented treatment is the first and only rejuvenating serum to combine the benefits of the proprietary growth factor blend, TNS Recovery Complex®, with potent antioxidants, peptides and other innovative ingredients to restore a youthful look to skin. Press on the center of the pump and apply a single pump onto the back of your hand, blend together and apply to the face, neck and décolleté morning and night. As with any skin care product, avoid getting in eyes. If contact occurs, rinse eyes thoroughly with water. Human Fibroblast Conditioned Media (TNS®) ? A physiologically balanced, naturally secreted and stabilized growth factor blend that helps improve the appearance of fine lines, wrinkles, and overall skin tone and texture. Ergothioneine (EGT) ? A super-antioxidant with free radical scavenging properties. Ubiquinone (Coenzyme Q10) ? An antioxidant that helps to counteract free radical damage and works synergistically with vitamin E.
Camellia Sinensis (Green Tea) Leaf Extract ? A natural antioxidant rich in polyphenols. Tetrahexyldecyl Ascorbate ? A stable form of ascorbic acid (Vitamin C), a proven antioxidant. Tocopheryl Acetate ? A form of vitamin E considered one of the most important antioxidants and free-radical scavengers. Rubus Fruticosus (Blackberry) Leaf Extract ? A natural antioxidant rich in polyphenols. Saccharomyces Ferment Lysate Filtrate ? A bio-optimized yeast extract that helps protect against the detrimental effect of ozone, which has an ability to deplete antioxidants in the skin. Alpha-Arbutin ? Visibly brightens the skin. Hyaluronic Filling Spheres ? Dehydrated filling spheres, containing hyaluronic acid, help trap water on the surface of the skin like a sponge. A: TNS Essential Serum® is appropriate for all skin types. A: TNS Essential Serum should be applied after cleansing and toning the skin and prior to applying any other products, including sunscreens. Note: TNS Recovery Complex is in one chamber of the TNS Essential Serum pump, you do not need to incorporate TNS Recovery Complex in your daily routine. A: Before the first application lightly tap the top of the pump several times in the palm of your hand. Remove the cap and press on the very center of the pump to dispense both of the products onto the back of your hand and blend them together before applying. A: Apply to your face, neck and décolleté. 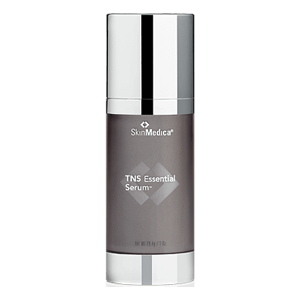 A: You should use TNS Essential Serum as long as you wish to improve the overall condition of your skin. Our clinical studies show that initial results occur in 30 days with optimal results occurring in 90 days. For best results, you should use twice daily and incorporate as part of your daily skin care routine. A: TNS Essential Serum offers an unprecedented combination of the renowned growth factor formula, TNS Recovery Complex in one chamber and APS Corrective Complex™ in the other. TNS® is the main ingredient in TNS Recovery Complex’s patented skin treatment which is formulated from naturally occurring growth factors, antioxidants, soluble collagen, cytokines and matrix proteins (93.6% concentration). APS Corrective Complex™ is a potent mixture of antioxidants, peptides and other innovative ingredients that in combination improve the overall appearance of skin. A: A mixture of growth factors, cytokines, antioxidants and matrix proteins. Q: What are growth factors? A: Growth factors are messenger proteins that are inherent in our bodies and play a crucial role in maintaining healthy skin. Q: Why does the TNS Recovery Complex have a bit of an unusual scent? A: TNS Recovery Complex has a 93.6% concentration of TNS which is a very high concentration of protein that has a distinct odor. Q: What is APS Corrective Complex? A: A patented mixture of antioxidants, peptides and other innovative ingredients that in combination improves the overall appearance of skin.